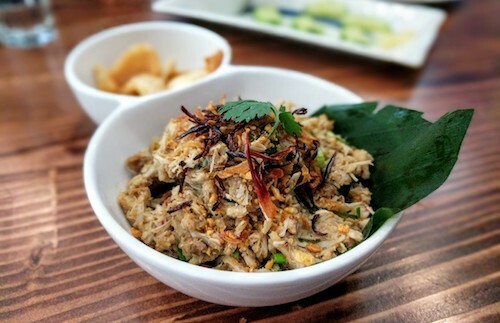 Almost as if a strong gust of wind swept through Elmhurst, the space which Ploy Thai occupied a few weeks back was reimagined and reborn as Lamoon, a restaurant with a concentrated menu of Northern-style Thai dishes. The new chefs are from Lampang and Chiang Rai, two neighboring provinces of Chiang Mai, and this is their first time cooking outside of their own kitchens. 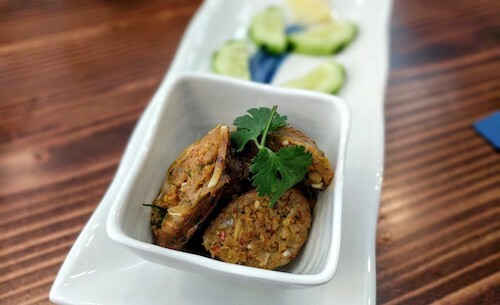 While Ploy Thai was good, Lamoon is an upgrade, and another entry into the city's Thai restaurant scene that specializes in a certain regional cuisine. 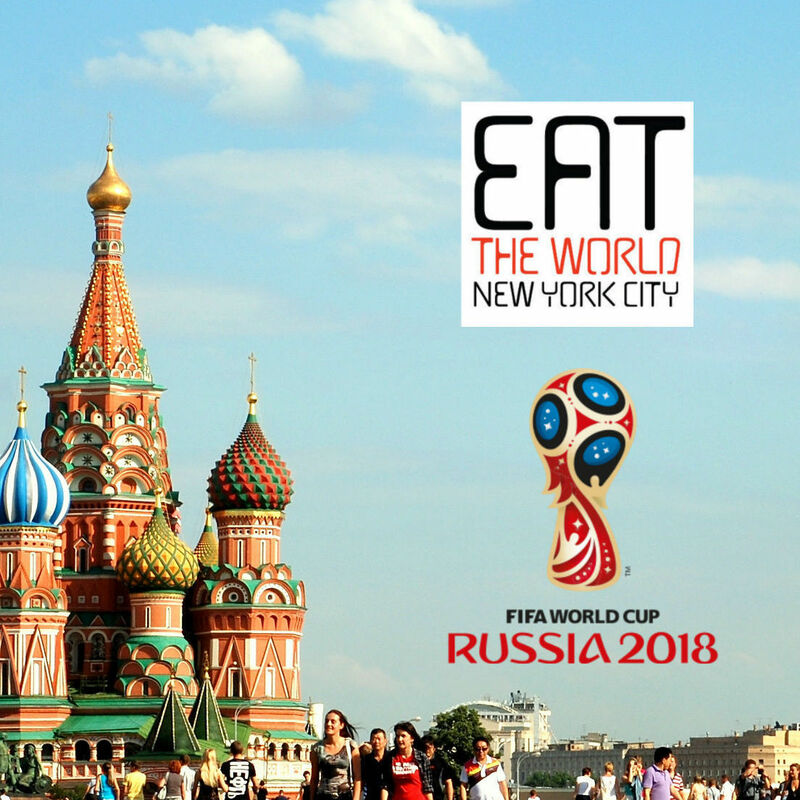 Places like short-lived Chiang Mai Restaurant and still strong Thai Diva Cuisine have been slowly introducing New York City to Northern Thai, and Lamoon seems to be interested in advancing these tastes. The space itself has had a quick makeover, as if a fresh coat of paint has been applied to the shell Ploy Thai left behind. 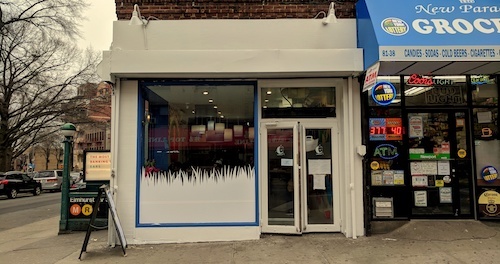 A friend of the new owners was flown in from Thailand to put colorful murals on the wall, and a white and blue color scheme to signify something new is afoot. During a small conversation, we also learned that the owner and chef from Ploy Thai was involved in the quick handover and is still helping the new business get set up. Her friendly spirit certainly lives on in the new restaurant. 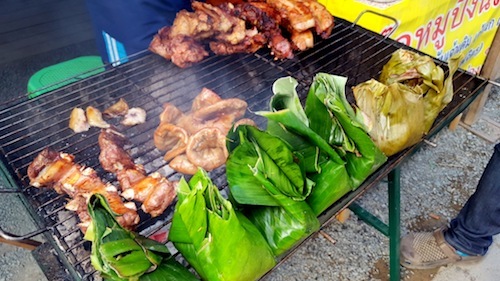 Inside of various banana leaves are sour fermented sausages and pork brain with shrimp paste, as well as various meats grilled straight over the fire. In Lamoon, they have a few options from these typical styles, and add a couple more things to wrap up and serve in the leaves. Because it has already been cooked, the first thing to arrive at the table might be the abb ong oor ($9, above and below), the aforementioned pork brain with shrimp paste. If you close your eyes and concentrate while eating this smooth and complex dish, you can pick out galangal and lemongrass as well as kaffir leaf, cilantro, scallion and shallot, garlic, dried chili, and tumeric. 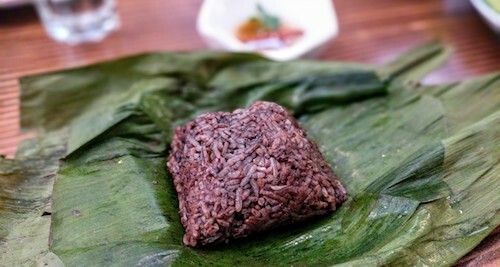 Another excellent dish to arrive in this fashion is khao kun jin ($7, below), a steamed mass of jasmine rice that takes its color from pork blood. This comes with a side of freshly made garlic and chili oil, and is absolutely a show-stopper. 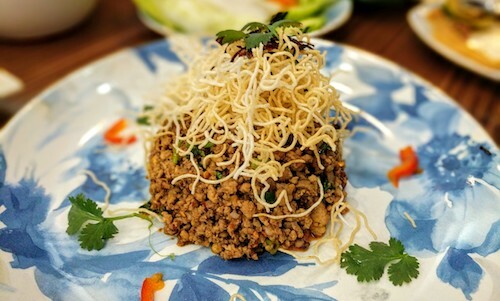 Even in Thailand this dish can be hit or miss, but this version is a bullseye. 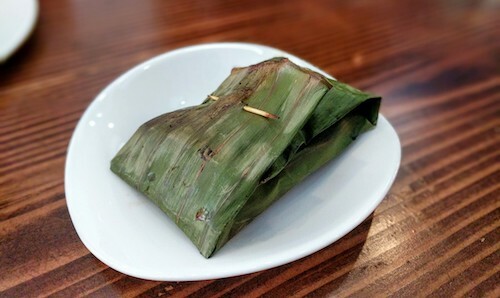 Some banana leaves come with a good portion of sticky rice, which may not come standard with your dishes but is an important upgrade to eat more like people in Northern Thailand do. Not seen on the grill from Mae Kampong above, sai ua ($12, below) is usually found alongside the banana leaves in coils that you can break off and purchase by weight. 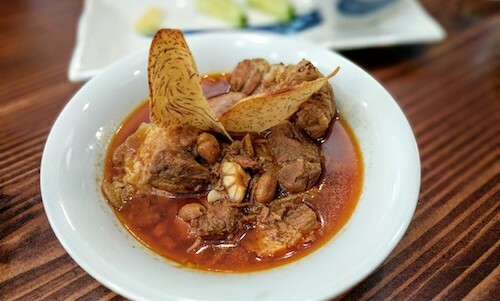 Cartilage from pig's ear make this version a bit different from the usual ground pork, but kaffir, lemongrass, and chili paste still take center stage. Not much more could be considered more northern style than nam prik ong ($10, below), a grounded pork with shrimp paste that is best eaten with sticky rice. It also comes with pork rinds and a range of vegetables for differing textures in each bite. 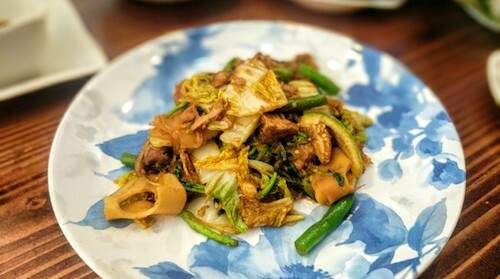 Tum kanoon ($12, below) is a young (green) jackfruit salad, but don't think you are getting too far from the pig with this dish as it also includes ground pork. A side of pork rinds and sticky rice comes standard. Seen only one previous time in Maplewood, NJ's Pho Thai Lao Kitchen, ant eggs make a small appearance on the yum mamuang ($8, below), a mango salad made with crispy fried sesame anchovies and carrots, shallots, cilantro, and peanuts. The whole salad is drenched in fish sauce, and delicious. 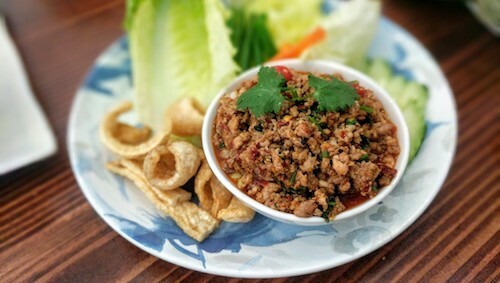 Similar to the word "neur" which means beef, larb neua ($11, below) is a northern Lanna-style larb ground pork and a homemade 9 herb shrimp paste. "Neua" is just a simple word for north. Of everything we ordered, this comes the most spicy, and thankfully cannot be toned down even if requested, as we were told this would take away its being so good. Pork belly is the protein of another northern classic kang hung ley ($12, below), served tender in a masala curry. Also find ginger, peanuts, and pickled garlic within. This might have been the first dish to be completely cleaned. Kang hoe ($11, below) is a dish made from the leftovers of kang hung ley, the pieces of meat are combined with glass noodles, various vegetables, bamboo shoots, and Thai eggplant. Anytime a trip to the temple is involved in festival plans, this dish plays a big part in that and is usually offered to the monks and volunteers. 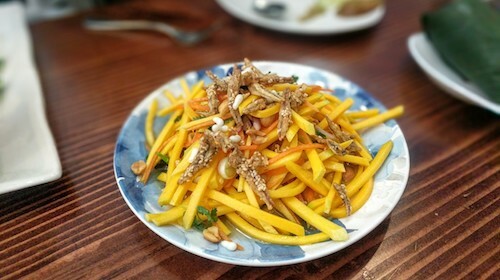 For a fuller story of this dish, please see our recent post from Ugly Baby in Carroll Gardens, Brooklyn. On our next visit, when there is not so much sharing of portions, orders of soups like khao soi and kanom jeen nam ngeaw will be essential to finish off the northern favorites. If you try them before we do, let us know what you think!